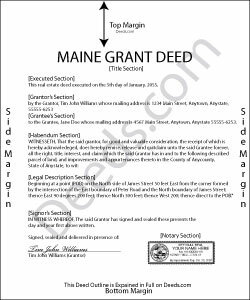 Real property transfers are governed by Title 33 of the Maine Revised Statutes, but the statutes do not specifically address grant deeds. A grant deed is a legal document used to transfer, or convey, rights in real property from a grantor (seller) to a grantee (buyer). It contains covenants, or guarantees, that the grantor has not previously sold the real property interest now being conveyed to the grantee, and that the property is being conveyed to the grantee without any liens or encumbrances, except for those specifically disclosed in the deed. Grant deeds do not generally require the grantor to defend title claims. A lawful grant deed identifies the names and addresses of each grantor and grantee. In addition, it states how the grantee will vest (hold) title. For Maine residential property, the primary methods for holding title are tenancy in common and joint tenancy. An estate conveyed to two or more persons is considered a tenancy in common unless a joint tenancy is clearly expressed (33 M.R.S. 159). Include the source of title and a complete legal description of the property; without these two things, the document does not constitute notice to third parties (33 M.R.S. 201-A(2)). The deed must be signed by the grantor and notarized and acknowledged before any of the officials listed in 33 M.R.S. 203. If applicable, the grantor's spouse must sign the deed to release his or her interest in the property (33 M.R.S. 772-A-1). A Transfer Tax Form (or Declaration of Value) must be filed at the County Register of Deeds' office at the same time as the recording of the deed (36 M.R.S 4641-4641N). If the sale is exempt from the transfer tax, state the exemption clearly on the deed. The transfer tax is collected based on the consideration paid for each transfer of property. Find a list of transfers exempt from this tax at 36 M.R.S. 4641-C.
Record the deed at the Register of Deeds' office in which the property is located. If the property is located in more than one county, record the deed in both counties (33 M.R.S. 201). All recorded real estate deeds, leases, or other written instruments pertaining to real estate in Maine will take precedence over unrecorded documents (33 M.R.S. 201). This article is provided for informational purposes only and is not a substitute for legal advice. Contact a lawyer with questions about grant deeds or transfers of real property in Maine. Abram A. said: Very easy to navigate around and to obtain desired forms and service.